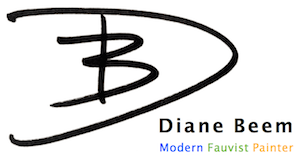 Welcome Video from Diane Beem on Vimeo. My art is about dismantling, rebuilding, and re-creating what I see. The pointillism in my paintings is a metaphor for the process of internal rebuilding. I am a studio painter. I take an image, usually a photograph or a sketch from a photograph. The original image is only a springboard into an inner vision. I paint in layers, and the process is laborious. Some days I can only put down so many dots, or brush strokes, and I need to move onto another piece. Other days the wind seems to be at my back, and I can cover a lot of canvas. I paint to bring myself out of the darkness. The purpose is to create a visual metaphor for hope and healing. The original image gets exploded, or broken down in my mind. and I endeavor to accept, look at, analyze, and ultimately rebuild, and recreate. The individual points come together in a kaleidoscope of color forming something new, beautiful, and whole. After completing my very first painting in art school, my professor boldly exclaimed out loud to the class (my face turning beet red! ), "We have a Fauve here!" Further embarrassed, I thought, "A who? what?" My homework was to go home and look up a group of painters called the "Fauves". To this day words cannot quite express what my eyes discovered. A kaleidoscope world of pure color and brush strokes that made my heart leap. I began to study this school of painting and have never looked back. I have yet to tire of taking an image from nature, re-arranging it in my mind, and applying the bold brush strokes and color of the "wild beasts"! An example of a Fauve painting: Landscape with Red Trees, Fauve painting by Maurice de Vlaminck, oil on canvas. Courtesy of the Musée National d’Art Moderne, Paris. Fauvism, a style of painting that flourished in France around the turn of the 20th century. Fauve artists used pure, brilliant colour aggressively applied straight from the paint tubes to create a sense of an explosion on the canvas. The Fauves painted directly from nature, as the Impressionists had before them, but Fauvist works were invested with a strong expressive reaction to the subjects portrayed. First formally exhibited in Paris in 1905, Fauvist paintings shocked visitors to the annual Salon d’Automne; one of these visitors was the critic Louis Vauxcelles, who, because of the violence of their works, dubbed the painters fauves (“wild beasts”). Diane holds a B.A. degree in German and Fine Art from Franklin and Marshall College, Lancaster, PA, and has also studied abstract expressionist painting at University of Hartford, Hartford, CT. She has been painting since 1995, and currently sells her work independently, and has collectors throughout the United States. Diane lives with her family in Auburn, Maine.